Today's swatches are from The Face Shop. The face Shop is a Korean-based cosmetics brand, and they don't really have counters in drugstores although they're a drugstore brand. They tend to prefer having standalone shops instead. They get a lot of traffic though, because they're pretty reasonably priced. They're cheapest in Korea though, so if you ever go there, do be sure to stop by and pick up some! The Face Shop has a few lines of blushes, and today we're looking at one of the more lauded lines, the Color Nuance for Cheeks. This is a line of powder blushes, and they have garnered some awards in a local Singapore magazine, so I thought they'd be good to swatch. That, and the fact that they only have 8 colours. LOL. Anyway, I found these to be lighty pigmented, as is common of Asian brand blushes. They're also quite blendable, so they'll be good for anyone looking for a hint of colour. These blushes didn't have anything weird, so that's good - no weird smells, no weird chunky glitter, and I think overall these aren't bad at all, especially considering they're drugstore. And as usual, here are swatches! PK101 is supposed to be the colour that won the award, but it's just a normal light pink. It's a nice basic neutral pink colour, but you know, every brand already has a colour like that. 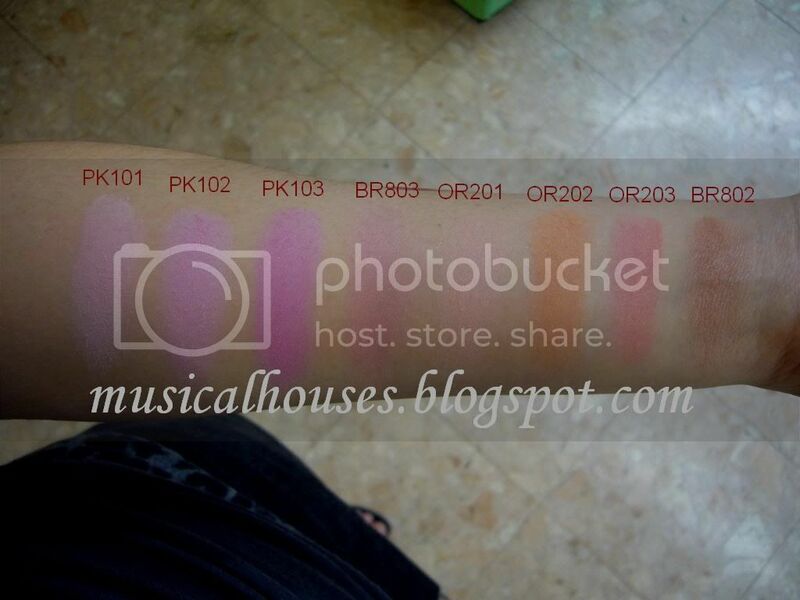 PK102 is also pink, but darker and less pastel. PK103 is a pink with a hint of magenta in it, but it's by no means dark. BR803 kind of reminds me of a less pigmented NARS Sin. It's that kind of plummy colour with some pink. OR201 is a light peach. OR202 is an orange colour. OR203 is a pinky peach colour. BR802 is a ruddy brown. Hm, cute! Thanks for sharing!